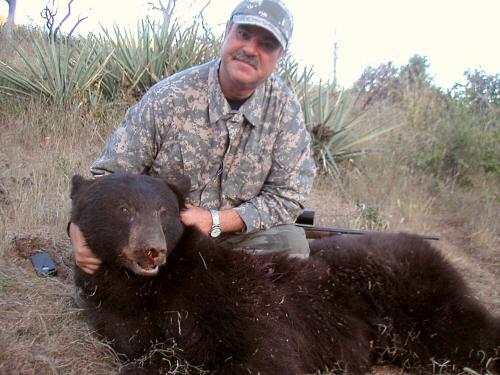 We are pleased to offer a unique bear hunting experience in Arizona! 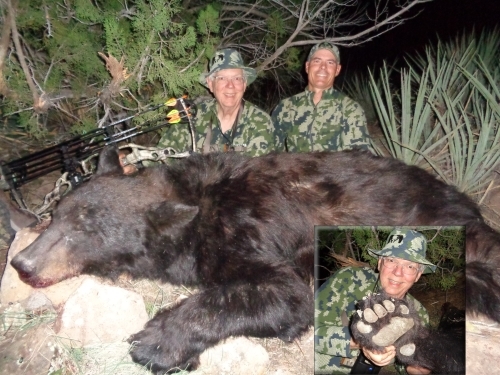 When searching for black bear hunts, many people would not ever think to look to Arizona. 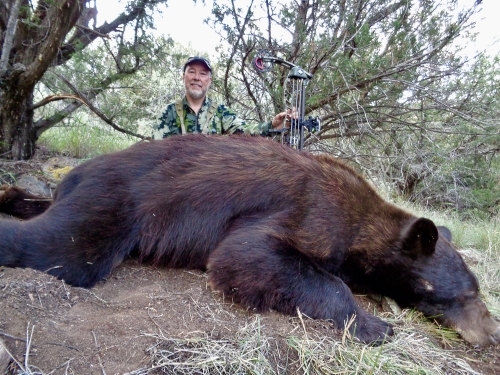 But, from recent experiences and publicity, more and more hunters are coming to realize that this State can provide some of the best trophy black bear hunting in the West. 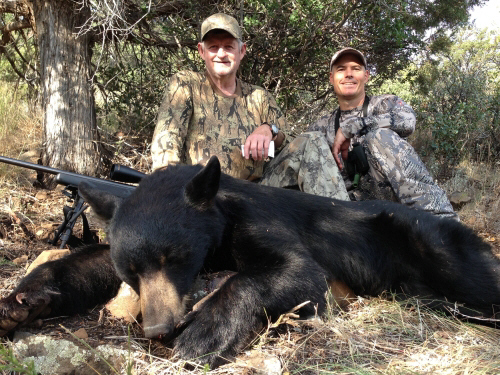 A glance at recent entries in the record books will show that Arizona has produced many "book" black bears. 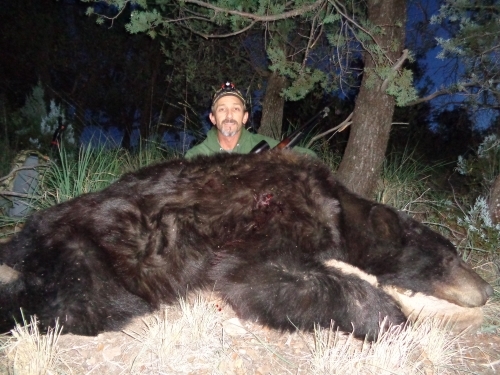 It is considered as a top choice for record-class bear hunting. 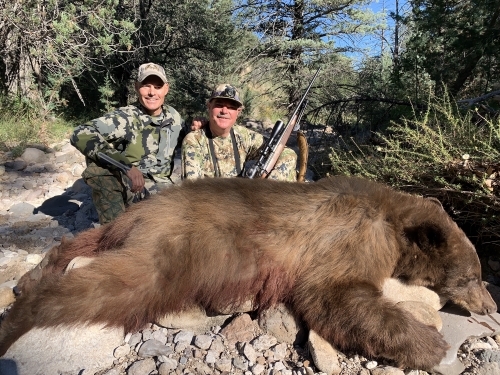 Though the quantity of black bears in Arizona is not high by anyone's standards, the quality of the bears (whether it be color, body size, or record book potential) is why many trophy bear hunters come here to hunt. The Arizona black bear comes in all color varieties (commonly referred to as "color phases"). Colors range from blonde, cinnamon, chocolate, to coal black. Seventy-five percent of the bears we have harvested over the past couple decades have been colored with chocolate brown being dominant. Arizona black bears live in the thick timber at higher elevations most of the year, but during the months of August through October (our typical hunting season) some bears come out of the high country in search of fat-building food sources. Bears have a very large home range and have been known to travel as far as 100 miles to find isolated pockets of food. This always keeps us "on our toes" trying to locate them before season. Some Arizona black bears travel to the lower desert elevations of their mountain ranges looking for prickly pear cactus fruit, which is very sweet and high in calories. This phenomenon is often called "Bears in the Pears." Arizona bears are typically in the pears during our August Archery-Only season. Bears may also travel to areas with a high concentration of acorns, juniper berries, mesquite beans, or manzanita berries during times when they are not eating pears, which is typically during the October Rifle season. What the bears are feeding on dictates where and how we hunt. Our bear hunts are "fair chase" in the purist form! Although every one of our big game hunts can be considered challenging, this is considered the most challenging hunt that we offer. Dogs or bait are not used on this hunt. We use two main techniques to harvest our bears, the spot-and-stalk method and the calling method. As a primary hunting technique, we hike to a good vantage point where a few square miles of terrain can be seen at one time. When a bear is amongst the sparse vegetation, it can be observed at very long distances using high-powered binoculars. We occasionally spot bears up to 2 miles away since they can stand out like a sore thumb. Once a good bear is spotted, we plan our stalk. Rifle shots can sometimes be across big canyons, so a Harris bipod, good high-power riflescope, and a big, flat-shooting caliber is recommended. Lightweight rifles are also needed in this very rough terrain. We prefer that hunters use .300 magnums or 7mm magnums topped with 4.5-14X or 6.5-20X variable scopes. Boat tail bullets from 150g to 180g are perfect for this long range bear hunting. Rifle shots average 300 yards, but be prepared for any distance (longer or shorter) if the need arrises. If you are a bowhunter, this spot and stalk bear hunt is the ultimate challenge. 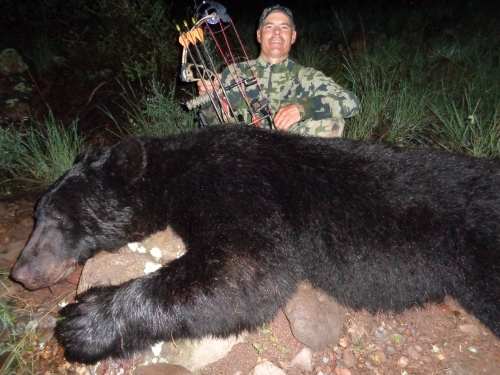 Stalking within bow range of a big Arizona bear can be a very thrilling experience! Bowhunters should bring a spare set of nerves! As a secondary technique, we use calling. Sometimes black bears prefer to stay in the mesquite, manzanita, oak and juniper slopes where they eat the beans, berries or acorns. These areas have thicker vegetation and allow for limited glassing. If this is where the bears are located at the time of your hunt, we may use limited glassing and a predator call. This technique is an exciting way to pull a bear out of the brush and within shooting distance. Some hunters have shot their bears after they came charging to less than 9 steps! Arizona bears are usually located in rough, remote areas, thus giving the potential to hunt older and larger bears. 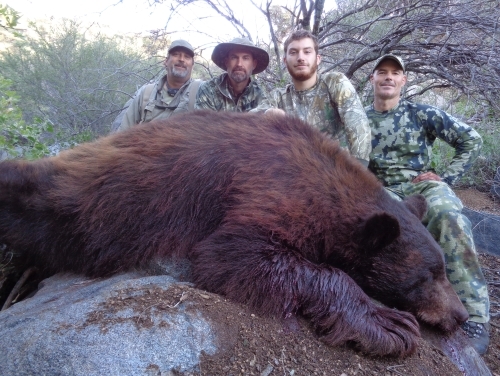 A few of our bear hunters have taken large males up to 500 pounds! Many of the bears taken have been 10 to 20 years old! Additionally, male bear rugs can often measure 6 to 7 feet with a couple taken up to 7.5 feet! 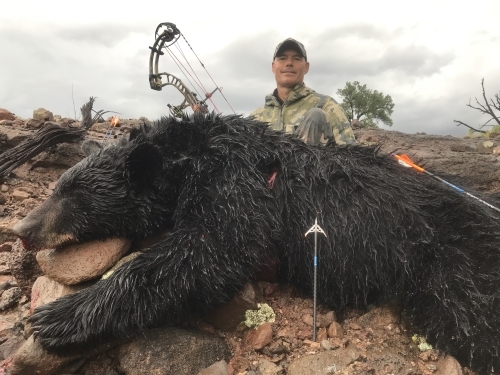 The outfitter has taken the former #8 SCI World Record Bear (21-13/16") and has taken a couple record-class P & Y bears with a bow, spot n' stalk style, including one measuring 20-14/16"! 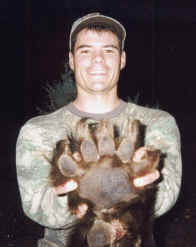 He and his guides have assisted several clients in taking bears that would measure in the top 50. If you fill your bear tag, the potential for it being an exceptional trophy is very good. Our Track Record: Over the past 20+ years, our Bear hunters have experienced a high shot opportunity and a good success rate. The "rate of opportunity" for our rifle season hunters has averaged around 75%. Even more impressive, the rate of opportunity for our hunters during the archery-only bear season has been 100%. Meaning, all of our past archery bear season hunters have had a chance! Archery season bear hunters typically encounter more bears due to the perfect timing of the season. Archery season is during a time when bears are encountered in more open areas, whereas, rifle season is when bears have moved to a new food source and into thicker areas. Several of our rifle and/or archery camps have experienced a 100% success rate! Unfortunately, due to the nature of bear hunting, success during some years has been low. Bear hunt success can fluctuate from year to year due to many factors. Bad weather, drought, too much food availability (causing bears to be spread out or hard to locate), the hunter's physical fitness level, or just "plain missing" were usually the limiting factors for the unfortunate bear hunters. Putting all statistics aside, you can "rest-assured" that we will do our best and will work very hard to ensure that you have an enjoyable hunting experience! We do not just cycle a multitude of hunters through our camps. But rather, we keep camp sizes to a minimum to ensure the utmost quality. Please feel free to contact our references and view testimonials. Accommodations: We use a Southwestern Style outfitter tent camp which is often located many miles from civilization. Sleeping quarters for big game hunts are typically in deluxe outfitter tents, unless noted otherwise. A trailer often serves as the kitchen/mess hall where hunters gather to eat. If you are looking for a hunt with fancy lodges, this is NOT the hunt for you! Tent camps are used because we stay in remote areas. The deluxe tents consist of either large outfitter Kodiak canvas or Alaknak tents. The size of our tents are tall and spacious inside; typically 10X10, 10X14, or 12x12 and stand 6.5-9 feet tall. The tents are equipped with heaters during the colder months. Cots with thick pads are provided, but all hunters must bring their own sleeping bags. For those that own a camping trailer and would like to bring it to camp to stay in are more than welcome to do so, but we cannot discount the hunt any. It must be high enough for ground clearance on rough dirt roads. Please ask for road conditions before bringing one. Video of our typical camp. Please Note: Unlike sitting in a treestand or elevated box blind near bait, THIS IS A REAL BEAR HUNT. The older age-class Arizona bears live in rough mountainous terrain, which can often be challenging. Hunters are encouraged to condition themselves to the best of their ability in order to increase their odds for success. Licenses and Tags: There is NO DRAW. Arizona fall black bear tags are over-the-counter (non-residents will purchase them by mail before arrival). Tag fee for non-residents: $165.00 and hunting license for non-residents is $160.00. This is a high demand hunt. Spaces are very limited. We usually only accommodate up to four 1-on-1 hunters in camp at a time, so book early. Contact us as soon as possible to reserve your spot. Choose a "Hunter to Guide Ratio" of either 1-on-1 or 2-on-1. The 1 on 1 rate means one hunter per guide. The 2 on 1 rate means two hunters per guide (share a guide). If choosing 2 on 1, you must bring the other hunter to share the guide with. Note: the 1-on-1 hunt will allow each hunter in camp to have his own guide, thus increasing the odds of each person harvesting. Archery Season bear hunters are guided 1-on-1 only. * Arrive to camp the day prior to hunting. Depart camp about noon on the last day of hunting. So, it's best if flying non-resident hunters arrive in Arizona the evening prior to meeting us (two days before hunting), rent a car from the airport, get a hotel room and we will meet the next day about noon in the hunt unit about 2 hours from Tucson or 3 to 4 hours from Phoenix. Flying hunters can follow us to camp with their rental car. Flights should depart the morning after the hunt, since travel time from camp to the city could be lengthy. More details on the general info page. Bear Hunt Includes: Complimentary accommodations (tent camps), meals, transportation in field while hunting only, packing out of animal, trophy prep, a guide and up to *5 days of hunting. A minimum 50% non-refundable deposit is required to book a hunt. The remaining balance is due at least 21 days prior to the hunt. We recommend cancellation insurance for all of our guests. Visit our policy page for more details. For those that own a camping trailer and would like to bring it to camp to sleep in are more than welcome to do so, but we cannot discount the bear hunt any. It must be high enough to be pulled on rough dirt roads. Please ask for road conditions prior to bringing one. Non-Hunter Fee: Some hunters like to bring along a buddy to camp and share the experience while they hunt. 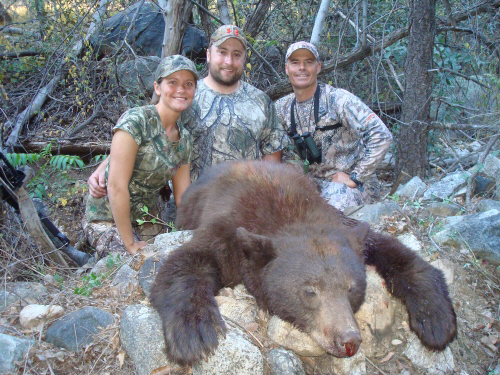 Invite your partner as a non-hunter or observer while on your guided bear hunt for a fee of $750.00. Non-hunter space is limited. Based upon availability. * Hunters must arrive in camp one day prior to hunting. Your hunting ends around noon on the last day of the hunt. Hunters pack up and depart shortly thereafter. So, it's best if flying hunters arrive in Arizona the evening prior to meeting us (two days before hunting), rent a car, get a hotel room and we will meet the next day about noon in the hunt area about 2 hours from Tucson or 3 to 4 hours from Phoenix. Flying hunters can follow us to camp in their rental car. Flights should depart the morning after the hunt, since travel time from camp to the city could be lengthy. Be sure you visit our general info page. 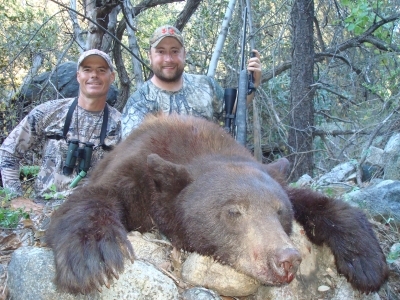 Also, read our bear stories for more feel of our hunts. 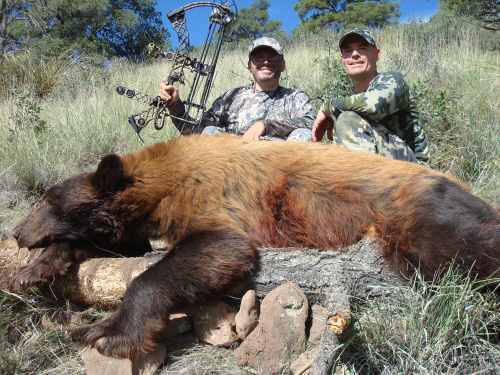 Denton Santarelli shot this big Arizona orange-cinnamon colored bear with his PSE bow at 38 yards. 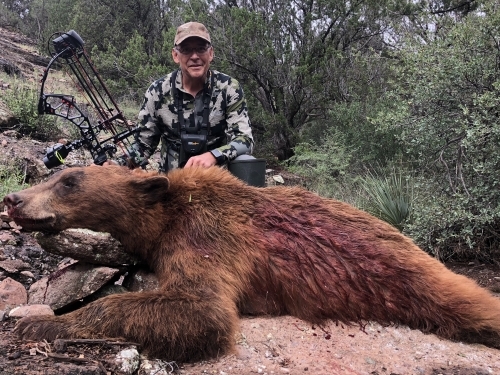 Seventy-one year-old Jimmy Fernandez shot this big brown phased bear with his 300 Ultra Mag. Rachel and Courtney Yockey from Illinois with Arizona bear guide Pat Feldt. This big bear has golden highlights on a chocolate base coat. 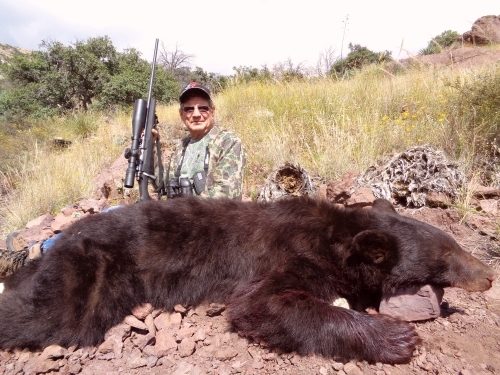 JJ Jeffries shot this brown colored bear at 300 yards with his 7mm mag. 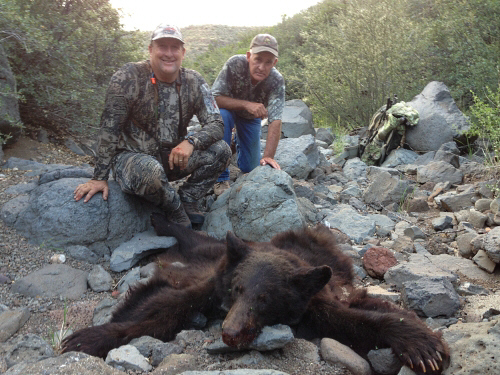 Hunter Chris Kincaid from Hawaii and Randy with a nice chocolate brown Arizona bear. The shot was 370 yards.